Face Value: Architects refine the art and science of facade design. The maintenance volume’s natural ventilation scheme includes windows that open automatically at optimal times. And just behind its south-facing skin, solar chimneys with a glazed area extend above the facade. In warm months, vents at the top of these shafts are opened to induce the “stack effect,” allowing hot air to move upward toward cooler air and then be discharged. In winter, the chimneys’ vents are closed to collect heat, which is then distributed throughout the interior with fans. The designers opted for a tilt-up wall system, with the surfaces of the concrete elements largely exposed on the interior to store thermal energy and take advantage of night-flush ventilation, as they did at Block D. They specified a vapor barrier on the exterior of the concrete wall, then 4 inches of mineral wool insulation board, which is water resistant. Between the terra-cotta plank-finished wall material and the insulation, there is a 1-inch air gap—screened and vented at the top and bottom of the wall—a typical detail in rainscreen systems. The gap serves two purposes: it helps the materials to dry out when moisture penetrates the skin of the building, and it allows convection to move warm air out of the cavity, reducing the amount of heat gain passing through the envelope. 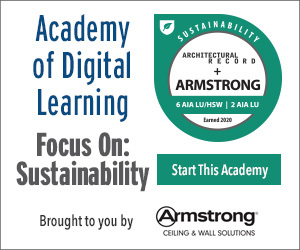 The assembly creates a “perfect wall,” a term coined by building scientist Joseph Lstiburek. It refers to the placement of the insulation and the control layers (for moisture, vapor, and air) outboard of the frame, in order to keep moisture out of the building and prevent thermal bridging (the movement of heat across an object that is more conductive than the surrounding materials and is a major source of heat loss in buildings). Glazing selection was critical for a west-facing multistory atrium at a new Amherst College science building (top 2). The Payette project team evaluated various options for energy efficiency and transparency with multiple digital tools. Any high-performance facade design requires architects to do their homework, but the Boston-based firm Payette is raising the bar on in-house investigation with its building-science department: the four-person group collaborates with design teams on all the firm’s projects but devote about half their time to speculative research, not—according to Andrea Love, director of the department—directly related to current projects but potentially paying off for the firm in the future. For instance, the building-science group created a tool to quantify the effects of glazing geometry and U-value (a measure of thermal performance) on occupant comfort and in reducing HVAC costs. 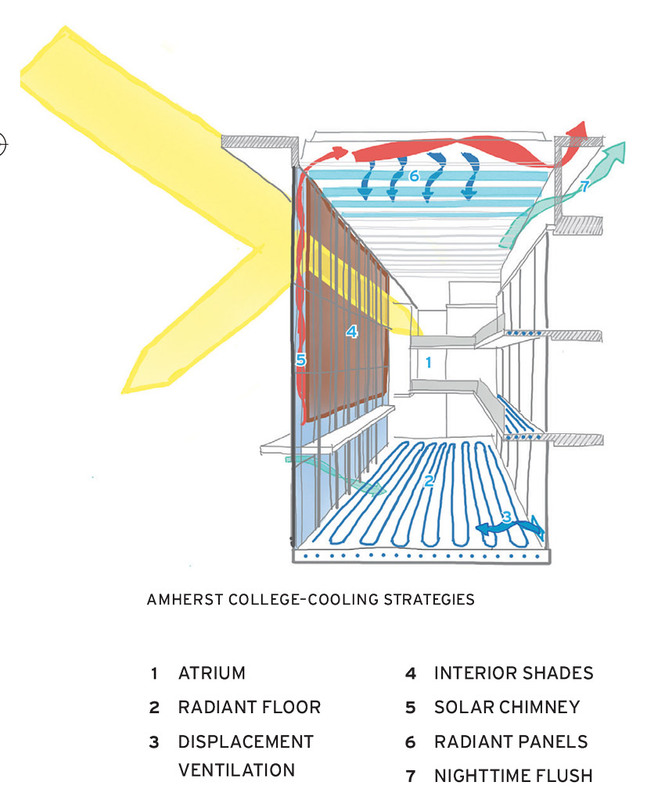 The software, available free on the firm’s website, subsequently helped Payette determine that it could eliminate perimeter heating on its Amherst College Science Center, completed in 2018. The 230,000-square-foot, three-story building sits at the eastern edge of the main campus in western Massachusetts, which is stretched north and south because of the configuration of the site. To connect the building to the campus, the scheme includes a highly transparent west facade enclosing a three-story atrium. Blocks of labs and classrooms, which the architects call “pavilions,” plug into the atrium. The atrium’s curtain wall is suspended from the cantilevered steel roof structure, allowing minimal mullions. To control the western sun, the architects specified internal roll-down shades that deploy automatically in four horizontal bands as the sun angle changes. In addition to avoiding glare, the setup also allows heat to be captured between the blinds and the glazing that is then vented via roof monitors to the exterior. The Science Center is projected to have an Energy Use Intensity (EUI) 76 percent below that of a baseline building (EUI is a means of comparing energy use among buildings and is calculated by dividing annual energy use by square footage). To select glass that would help deliver this performance, the design team compared the available types of triple-glazed windows for optimal energy efficiency, shading, and transparency. In consultation with the mechanical engineers, the architects found that reducing the Solar Heat Gain Coefficient (SHGC)—which is typically controlled with low-E coatings—from 0.35 to 0.28 would achieve a 22 percent cut in peak cooling load. The reduction allowed the elimination of one air handler at a substantial savings. Once the designers established these performance targets, they input data from different manufacturers into the thermal-performance software WINDOW and also ran it through the daylight- and glare-simulation program Radiance (both are open-source tools developed by Lawrence Berkeley National Laboratory). The results of the digital analysis, along with physical mock-ups, aided the architects in selecting a glazing system with the desired aesthetics and transparency. The largely glass facade of the new headquarters building for Washington, D.C.’s water utility includes “sunglasses” to reduce heat gain while maintaining views. These consist of an exterior layer of suspended tinted glass that sits outboard of the windows by 3 feet. The Science Center’s lab and classroom blocks are mostly clad with a perforated weathering-steel rainscreen system that includes stainless-steel connectors tying the panels to the structure. The project team arrived at this solution using imaging software to study various wall assemblies, to determine which produced the least thermal bridging. The results showed that stainless attachments would be one-third less conductive than typical steel. Analytical and digital tools were also central to the design process for SmithGroup’s headquarters for the District of Columbia Water and Sewer Authority, recently completed on a wedge of land between the Anacostia River and an existing D.C. Water pump house. In developing the six-story, 150,000-square-foot office building, designers first had to contend with an array of view sheds, setbacks (two-thirds of Washington’s wastewater flows beneath the site in a complex web of critical infrastructure), and programmatic challenges such as the requirement that the new facility integrate the historic pump house without having a negative effect on the operations or integrity of the older structure. The new, sinuous office building stretches the undulating south facade to face the river. Integrated into the north side of the building, a 200-foot-long truss spans over the old pump house. The designers used parametric design tools to help shape the curvilinear skin, which was faceted into 4-foot-wide by 14-foot-high flat panels, primarily of glass. Adding to the complexity of the form, each successive floor of the south facade steps out 2 feet to create sunshades for the level below. SmithGroup drew on the expertise of its team of in-house specialists, referred to as a Technology in Practice (TIP) group, to help design many of the facade elements. For example, the TIP assisted in defining the ideal overhang for shading and determining the potential for glare and heat gain. Using a variety of open-source software tools, the architects and the specialists designed a system of automated interior blinds programmed to maximize beneficial light and reduce negative effects. The team digitally mapped areas of the south facade where transparency was important but heat gain was problematic. For these locations, the designers created an exterior layer of suspended tinted glass panels that function as “sunglasses” for the building, says SmithGroup principal Sven Shockey. Fastened to the overhang above, the laminated green glass is 3 feet from the face of the window and incorporates the tinted inner layer to reduce heat gain while maintaining the views to the river. In addition to the high-performance facade, the headquarters building includes such innovative technologies as a heating and cooling system that takes advantage of the wastewater flowing beneath the site. It depends upon a closed-loop heat exchanger and helps the design achieve a 45 percent energy-use reduction compared to a benchmark building complying with ASHRAE 90.1. With these features and others, including a rainwater-collection system with two 20,000-gallon cisterns, the project team is targeting LEED Platinum. 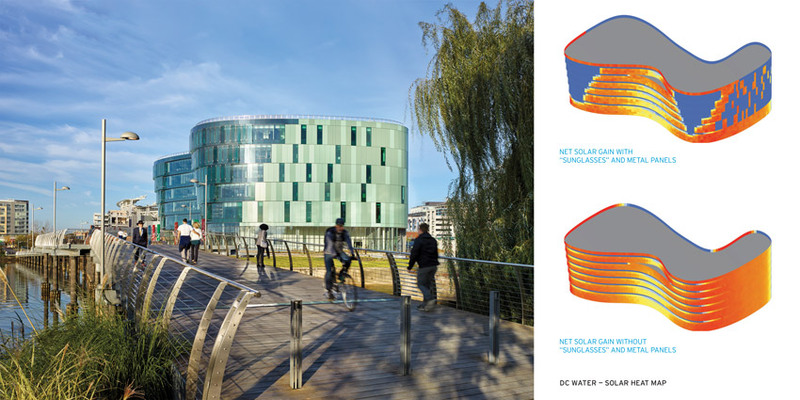 SmithGroup’s impressive results for D.C. Water, and those of BNIM and Payette in Southern California and western Massachusetts, show that it is still possible to push the envelope on high-performance facade design. Old-school experience, deep research, and evolving design tools are not only making buildings more comfortable for their occupants but, by conserving resources, are improving the environment for all of us. Michael Cockram is a freelance writer and director of Bowerbird Design in Fayetteville, Arkansas.